Laser engraved wood looks amazing. On your wall at home, on your desk at work, or anywhere else, it really brings elegance to any setting. You have settings, of course, so why not add elegance to them? We can custom-create laser engraved wood pieces for you and beautify your life. Plaques, signs, picture frames — we do it all. If it’s wood, we’ll make it into laser engraved wood! It’s just what we do. Want a set of matching engraved baseball bats for your team? We can do that for you. Got a groundbreaking ceremony and you want personalization of the shovels and sledgehammers? We’ve laser engraved wood with names more times than we can count! Laser engraved wood makes a classy groomsman’s gift, too. Knives with wooden handles, custom pool cues — if it’s got a wooden surface, we’ll engrave it for you. A stylish family tree drawn in laser engraved wood? Great idea! That’s a fantastic conversation piece. Need a custom piece etched into a table top? Bring that table on by and we’ll get that done for you! No one’s better at making custom laser engraved wood than we are. We bring an artist’s touch to the lasers, which sets our work head and shoulders above the competition. No matter what request you have, or what surface you need it engraved on, we’re the company to turn to first. Our skill, our speed and our prices are all the best that you’ll find anywhere around! So look no further. If you’ve got a request, simply fill out the RFQ form below and let us know what it is you need. 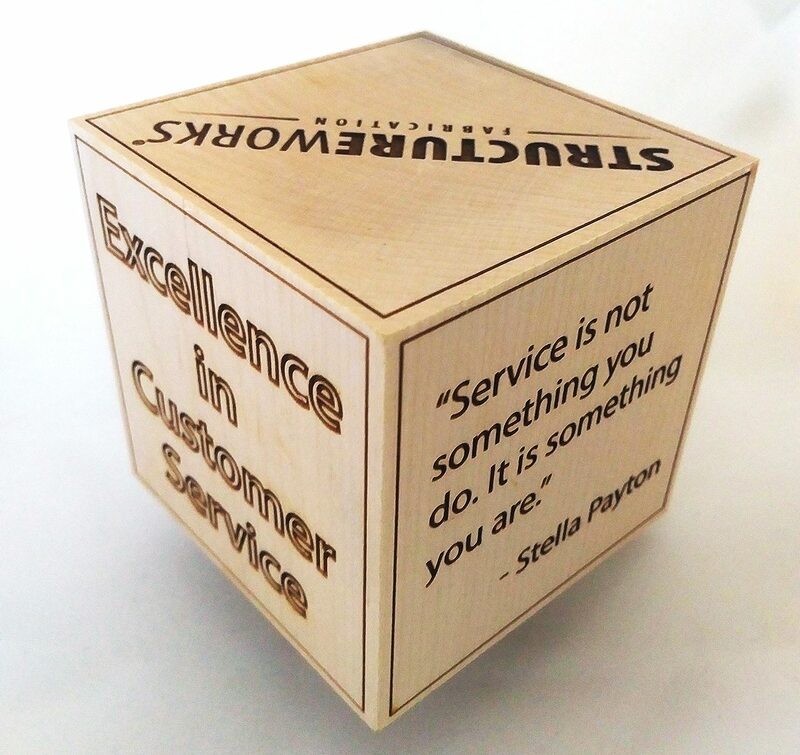 We’ll respond with a custom quote, you’ll be delighted and amazed, and we’ll be in business! 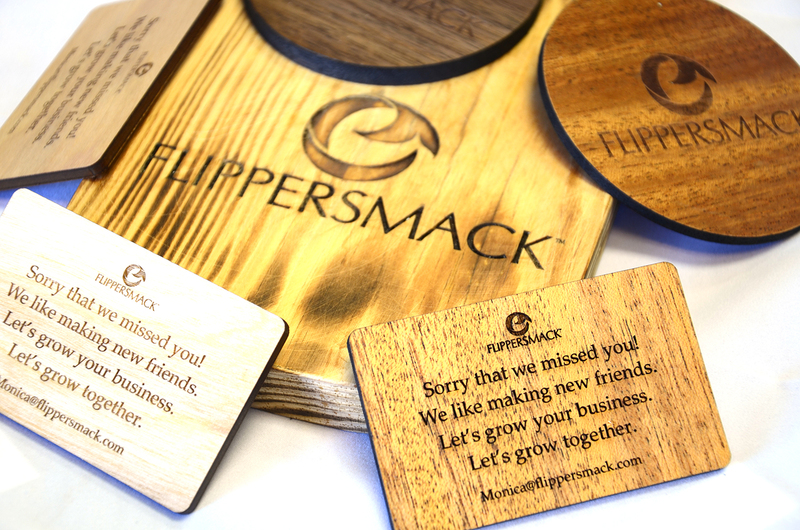 Try Laser Engraved Wood for a Touch of Understated Elegance! This is the story of a tree. 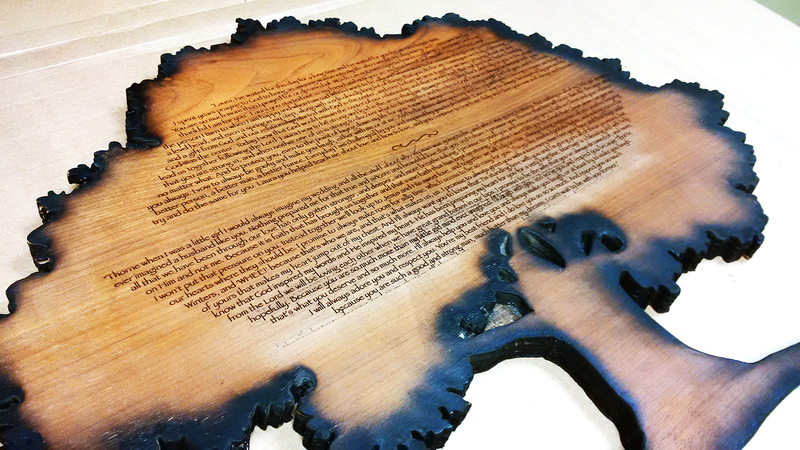 It ends with a beautiful piece of engraved wood, which is a very happy ending for a tree, but we’re not there yet. Right now, we have a lovely, strong tree, just waiting to be fulfilled. So how do we get from there to that custom piece of engraved wood? Follow along and we’ll tell you! First, the tree is cut down and processed. Many trees in this situation are destined to become particle board, paper or even just pulp, but not our tree! Its attractive shape and color have marked it for better things. Our tree is carved into thick boards, polished to show its grain off to best effect, and stained to enhance its natural beauty. All of this is a good start, but the final touch comes from the burning kiss of a laser. That’s what finally takes it to the engraved wood we mentioned at the start! That’s also where we come into this process. We’re not lumberjacks, and we’ve never been in a lumber mill in our lives. But we can wield a laser like no one else, and we’ve made some fine engraved wood in our time! In fact, it’s fair to say that we make the best engraved wood around. How are we so good? Years of focused practice. Back when other kids were just carving their initials into trees, we were already turning blank plaques into engraved wood. That kind of dedication shows! And we’re ready to put our services to work for you. So if you’re looking for engraved wood, fill out the RFQ form below and we’ll get you a custom quote on the double. Help that tree reach its potential! Need Engraved Wood in Your Life? Of Course You Do! Custom Wooden Signs Make Your Business Look Timeless! Custom wooden signs are a thing of beauty. Everyone agrees about this! No one has ever said, “Hey, those custom wooden signs look tacky.” Except for maybe badly hand-cut ones, which are a whole different thing. You’ll never see those here! For our custom wooden signs, we use only the finest modern lasers. Look at this graphic to the left. What’s a flippersmack? No one ones. And no one cared before now! But with custom wooden signs, people will suddenly both know and care. After all, if it weren’t important, why would someone take the time to inscribe it into wood? We don’t know either! But we did it. And that’s the sort of gravitas we bring to our custom wooden signs. Look around your place of business. How many signs do you have? Probably dozens. Even when you looked, your eye skipped over several of them. You probably never saw the exit signs, the break room notices, the multitude of other mundane signs. How do you draw the eye to these? Simple — put custom wooden signs in their place! No one overlooks that sort of class. Plastic is the go-to resource these days, and it shows. Everyone uses plastic, and so it looks classless. Add a touch of elegance to your establishment with custom wooden signs! Once you hang that laser-etched tree slice up, no one will ever confuse you for a run-of-the-mill place of business again. It really is just that simple! Regular business + wooden sign = business with a five-star review on Yelp. That’s just science! So contact us through the convenient RFQ form linked below. We’ll get you hooked up with custom-carved wood immediately. Just see the difference! You Look Like Someone In Need of Custom Wooden Signs. Let Us Help You Out! Custom wood signs are the best way to display your message. Whether it’s advertising, an ORDER HERE or PICK UP HERE, or simply a humble bathroom sign, everything looks better when you make it into custom wood signs! That’s not us speaking, it’s a simple matter of fact. Anyone can print things onto plastic, paper or other flat surfaces. But who can etch it into wood? We can. And what if your wood isn’t flat? We don’t care. We can make your custom wood signs on flat wood, curved wood, completely spherical wood. We’ll make custom wood signs out of living trees if you ask us to! The National Park Service might get mad, but we’ll go the extra mile for you. Custom wood signs add that touch of class to whatever you’re doing. Picture the grossest thing you can think of. Now stop it; that’s gross. The point is, even that thing is made classier by the addition of custom wood signs! They’re that effective. No one can argue with that. So if you have a business, or want a business, or just want people to think that you know your business, do yourself a favor and get a custom wood sign today. It instantly raises you to the next level! And if you’re already at the next level, it takes you one beyond that. Even if you’re a bleeding-edge ultra-modern company, custom wood signs will take you straight through retro and back around into the upcoming next wave! Dead trees never go out of fashion. If you don’t believe us, go for plastic, metal or cardboard. And when you’re tired of being lumped in with everyone else, give us a call and let us get you into wood! We Will Make Custom Wood Signs for You! What can custom wood engraving do for you? I’m glad you asked! The real question, though, is what can’t it do for you? Picture any piece of wood you have. A chessboard, a baseball bat, a blank wooden plaque. Now imagine each one with your own personal flair! That’s what custom wood engraving can do. You may be thinking, “Sure, I can picture this on a plank, but how can custom wood engraving work on a nonstandard piece of wood?” I’ll tell you how: lasers. We’ve been using lasers to etch wood for years. We’ve done hundreds of projects, and our skill is unparalleled. No one even comes close to us in the custom wood engraving business! Custom wood engraving adds flair to any piece of wood. That’s its main power! Without custom wood engraving, you’ve just got another soulless, indistinguishable object. With custom wood engraving, suddenly you’ve got something unique and engaging, a conversation piece which will be the envy of all of your friends! People will comment on it around you, and discuss it with your mutual friends when you’re not there. It might sound like I’m overstating the power of lasers and wood combined, but I assure you, if anything I’m understating them. There’s just such a fantastic power when you meld the future with the past! Absolutely nothing is like it. You’ll discover a style that’s distinctly your own! We’re just here to enable you. Consider all of the wood in your life. Have you treated it well lately? Shouldn’t you? It’s treated you well, hasn’t it? Treat your wood to laser engraving today. Send it to us and let us customize it for you! We’re excited to show you its true potential. You Need Custom Wood Engraving. You Know You Do. Nothing’s classier than fine wooden keepsakes. But if you don’t have any such keepsakes, how can you get some? That’s easy: just take anything wooden you have and get it custom laser engraved. Chairs? Boring. Custom laser engraved chairs? Fantastic! You can put your name, your wedding date, or maybe just a pithy saying. Whatever you want! They’re your future heirlooms. Have some fancy wooden plates around your house? We can make those custom laser engraved, too. Picture frames, plaques, maybe just a weird block of wood that you really like for some reason? Lasers make everything better! Check out the watch over here. Even puns become classy when they’re custom laser engraved. And that takes some doing! We are nothing if not dedicated, though. If you want a pun on a watch, we’ll get that watch custom laser engraved with a pun for you. You’re probably expecting us to make a pun here, but we won’t. We’re above that. Back in the day, nothing was engraved with lasers. Why is that? Because lasers didn’t exist yet, that’s why. And that’s the only reason! We have it on good authority that George Washington would have custom laser engraved his dentures if he’d had the option. If it was theoretically good enough for the father of our country, how could it fail to delight you? So bring us your wooden tchotchkes, your mantelpieces, your mailboxes and oars. If you’re ready to have them custom laser engraved, we’re ready to make that happen for you! We’ll engrave anything you bring us. Flat, round, large, small — we’ll mark it all with your message or picture. Every edge will be crisply cut in the way that only a laser can manage! We’re Excited to Make Your Stuff Custom Laser Engraved!